These Bacon and Cheese Potato Skins are so deliciously good that it’s easy to forget that they also deliver more than 30 grams of protein per serving. Fun to prepare with kids or to serve when you’re hungry for hot food that’s easy to put together with ingredients you typically have on hand. Preheat oven to 400°F. Brush both sides of potato slices with butter; place them on an ungreased cookie sheet. Bake in the preheated oven for 30 to 40 minutes or until lightly browned on both sides, turning once. 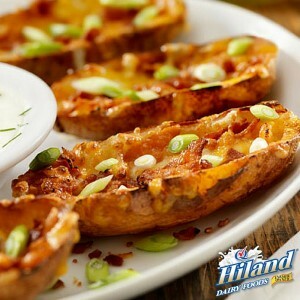 When potatoes are ready, top with bacon, cheese and green onion; continue baking until the cheese has melted. Tip: Hiland Dairy Sour Cream is a great addition when serving these potato skins.